Is Kushner bringing conflict, not peace, to the Middle East? Several top Trump administration officials, including the president’s son-in-law and adviser Jared Kushner, slammed Iran this weekend, demonstrating that the administration is maintaining its support for Saudi Arabia and its efforts to contain Iran’s influence in the Middle East. But experts argue their rhetoric might be hurting the administration’s diplomatic efforts. 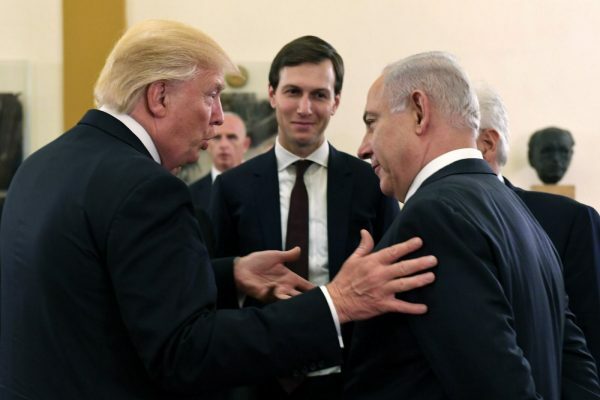 In a rare public appearance at the Brookings Institution on Sunday, Kushner said brokering peace between the Israelis and Palestinians would help counter Iranian aggression in the region. Kushner has been dispatched as the face of the administration’s diplomatic efforts in the Middle East, but experts say his rhetoric against Iran might do more harm than good. Over the past week, fighting intensified in Yemen between Iranian-backed Houthi rebels and forces allied with Saudi Arabia. As the humanitarian situation in Yemen worsened, Kushner wasn’t alone in condemning Iran. On Saturday, CIA Director Mike Pompeo, who rumors suggest could become the next Secretary of State, and national security adviser H.R. McMaster both criticized Iran during the 2017 Reagan National Defense Forum in California. “What the Iranians have done across the Middle East is fuel and accelerate cycles of violence so that they can take advantage of chaos and weak states to make them dependent on Iran for support,” McMaster told the audience. The comments come as tension between Saudi Arabia and Iran grow more acute, and as Kushner plays an increasingly active role in bringing Iran’s regional enemies together. But experts say Kushner’s strategy of isolating Iran won’t provide any big wins for the U.S. and its allies. “Playing a hard line with Iran isn’t going to get us anything. It’s not going to get them to do what we want in any way shape or form,” Martin Edwards, a diplomacy expert at Seton Hall University’s School of Diplomacy and International Relations, told Newsweek. Still, some say that bringing diverse allies together against a common enemy might be a clever strategy. Kushner has assembled a team of experts to work on negotiating a peace deal, and has developed close relationships with diverse regional actors including the king of Jordan and Saudi Arabia’s crown prince. But the administration has also said it is planning to move the U.S. embassy in Israel from Tel Aviv to Jerusalem, a move experts say would jeopardize the peace agreement. On Friday, Jordan’s King Abdullah II warned that the move would spark outrage across the Arab world. Even if Kushner’s plans for Middle East peace fail, however, Cordesman says it’s important just to keep the Israelis and Palestinians talking to each other. Kushner is nothing but trouble. His father was jailed for white collar crimes and he is no different. He needs to go..